Sagami Weizen is a 5% hefeweizen from Koganei Shuzo that is brewed to a German recipe that contains over 50% German wheat, with the deeper colours being provided by the pilsner malt used too. Sagami Weizen can be found on draft and also in bottles across Kanagawa. And that’s all about I could find out about it. Big frothy head from a lively lively beer. 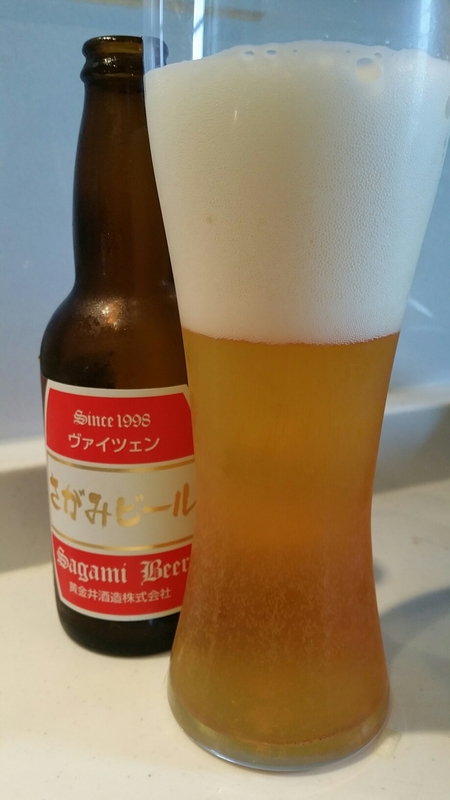 Sagami Weizen was a lively beer out of the blocks – the picture above was after letting it settle for about five minutes and even then, the head retention was incredibly long. I would have needed a spoon to scoop through all of the head to get to the beer. After letting it settle down though, there was a nice aroma of wheat but the banana and clove smell was distinctly lacking. Perhaps the carbonation in Sagami Weizen was too high in the bottle as the bubbles were streaming up from the bottom at this point, perhaps the liveliest I’ve ever had. All that gas though had to go somewhere and Sagami Weizen was quickly nicknamed the “burping beer” as I just couldn’t stop. The flavours though had either been muted by the carbonation or gone on walkabout, as all I could really taste was the wheat. Where were the bananas and spices? Had Koganei Shuzo put the wrong yeast in the beer? It didn’t get any better through to the aftertaste either but by then I had forgotten to make any more notes besides “wheaty”. There was little to no information about Sagami Weizen and it’s no wonder. Leave this beer alone on the shelf.